The Dawn spacecraft is approaching Ceres and has begun observations, including this first animation. Ceres is a dwarf planet that resides within the Asteroid Belt between Mars and Jupiter and is the last unexplored spherical body (that we know of) that resides within the orbit of Neptune. Earlier observations by the Herschel Infrared Space Observatory have suggested the presence of water vapor in the form of plumes near the surface of Ceres. There is even the chance that this comparatively tiny body may somehow maintain a tenuous atmosphere. If any of this turns out to be the case, we currently have no models to suggest how geological activity could be generated on such a small world. We have known for a very long time that internal heating and geological activity is common on bodies whose mass is large enough to create their own internal furnaces (Earth, Venus and gas giants like Jupiter). More recently we have discovered smaller geologically active worlds that generate internal heat from tidal forces inflicted by their host planet and neighboring moons (Io, Enceladus, probably Triton). 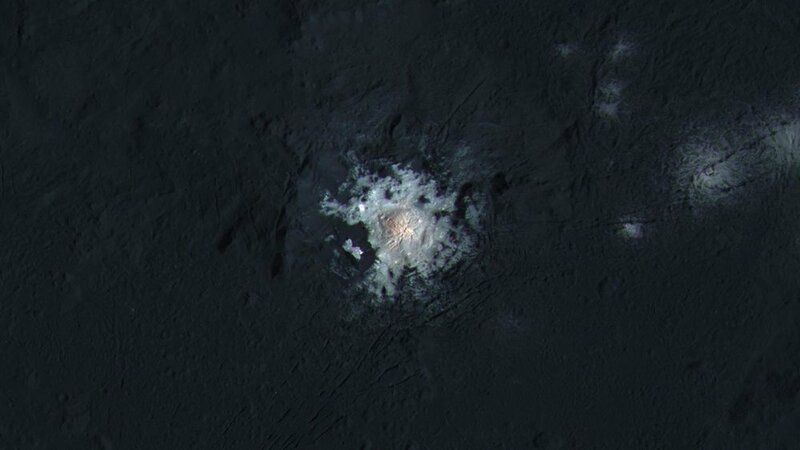 But we have never seen such a small isolated body such as Ceres manage to do anything but display ancient craters and fracturing from cataclysms dating back to the formation of the solar system. Logic tells me to expect to see a grey cratered ball when Dawn goes into orbit around Ceres this Spring, but the experience of Voyager and Cassini tells me not to expect anything but the unexpected. Also, what is that bright dot? It has been in every image of Ceres since Hubble started observations to support the coming encounter.